This chapter is intended as a short introduction to electron flow in nanostructures. Its aim is to provide a brief overview of this topic for people who are interested in the thermodynamics of quantum systems, but know little about nanostructures. We particularly emphasize devices that work in the steady-state, such as simple thermoelectrics, but also mention cyclically driven heat engines. We do not aim to be either complete or rigorous, but use a few pages to outline some of the main ideas in the topic. 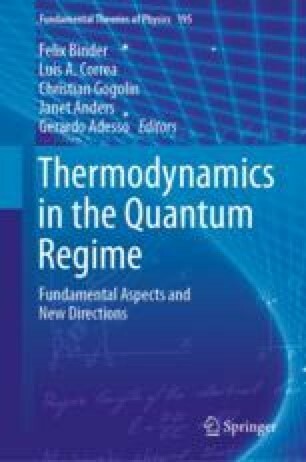 We acknowledge the support of the COST Action MP1209 “Thermodynamics in the quantum regime” (2013-2017), which enabled us to meet regularly to learn about and discuss much of the physics presented in this chapter. RW acknowledges the financial support of the French National Research Agency’s “Investissement d’avenir” program (ANR-15-IDEX-02) via the Université Grenoble Alpes QuEnG project. RS is supported by the Spanish Ministerio de Economía y Competitividad via the Ramón y Cajal program RYC-2016-20778. JS acknowledges support from the Knut and Alice Wallenberg foundation and from the Swedish VR.